As Managing Partner at Vertaeon, Rekha is responsible for setting overall organizational vision, and product/market development for Vertaeon’s supply chain risk and sustainability and energy analytics products. Prior to Vertaeon, Rekha led comprehensive enterprise risk assessment and CSR strategy development at NV Bekaert SA, directly reporting to the CEO and periodically to the Audit & Finance Committee of the Board. 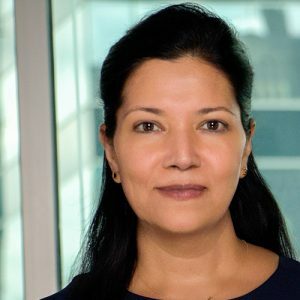 At Bekaert Group Business Development, Rekha managed global teams in growth opportunity identification, JV/ M&A option assessments, regional and global strategies, and long-term scenario planning, for multiple $1Billion+ businesses. Prior to this, Rekha worked for over 10 years in the US Chemical industry, with Lyondell (and its Arco/Millennium subsidiaries) as Global Market Manager and in multiple Engineering roles. Highlights include cross-functional leadership for new product development for the consumer products value chain, and the Chairman’s award at Millennium for optimization and yield improvement without CAPEX. Rekha holds Bachelors in Chemical Engineering (with Distinction), Masters in Chemical Engineering from Auburn Univ. at Auburn, AL and MBA from the Wharton School at Univ. of Pennsylvania. She is part of the alumni advisory group for Wharton IGEL initiative.